Lisa Joswick is the creator of this clothing line for both girls and boys sizes 12M to 6X. It is for all seasons and come in a wide range of styles and colors. Lisa graduated from Auburn University with a degree in Fashion Design. She has always wanted to design children’s clothing and she finally has the opportunity to do so. Wiggles and Giggles started taking their first order in Oct. 2005. I was happy to add another beautiful dress to Sadie’s spring/summer wardrobe. 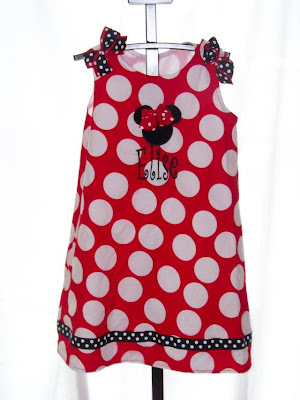 Living in a small town its hard to find cute dresses for little girls that everybody doesn’t already have so I am always on the lookout for different and cute things that nobody else will have. This A-line dress is adorable and had a S and her name on the front. I can’t wait until she can wear it out and not just in the house playing dress up. This dress retails for just $45 and is well worth it. They have lots to choose from at www.wigglesandgiggles.homestead.com Check them out.